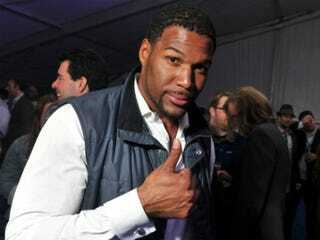 Michael Strahan Set to Replace Regis Philbin? (The Root) — Plenty of pro football players hang up their cleats and transition to coaching careers. Far fewer go from making plays as athletes to calling plays as broadcasters. Then there's the select number who make the leap from sports to pop culture, becoming mainstream entertainers in film or TV. Hall of Fame running back Jim Brown retired at his peak in 1966 and went on to star in more than 40 movies. Around the same time, Fred Williamson went from being an NFL defensive back to one of the first "blaxploitation" stars. More recently, O.J. made a name in Hollywood before he was named in a murder case. Successful moves to the small screen have been far less frequent, unless you count reality-TV shows that have featured the likes of Deion Sanders, Terrell Owens and Chad Ochocinco. But it looks as if broadcaster Michael Strahan is about to set a new standard for former pro athletes gaining TV prominence that's not sports-related. According to Broadcasting & Cable, and since reported by multiple other outlets, the former Super Bowl champ with the New York Giants will replace Regis Philbin next month as co-host of Live! alongside Kelly Ripa. She's expected to make the announcement during the Sept. 4 broadcast. Daytime TV is nothing like Strahan's previous ventures, extensive as they are. Besides weathermen Al Roker and Tony Perkins, game-show host Wayne Brady and former longtime Today co-host Bryant Gumbel, not many African-American men have starred on shows with predominantly female audiences. But despite his former occupation as a defensive end who terrorized quarterbacks, and despite his size — he stands 6 feet 5 and weighed 275 pounds during his playing days — Strahan is viewed as a cuddly teddy bear. He's been positioning himself for this transformation ever since he retired in 2008, after 15 NFL seasons. He's currently an analyst for Fox NFL Sunday and stars in commercials for Dr. Pepper, Pizza Hut, Snickers, Subway and Right Guard. Strahan has also guest-starred on multiple shows, co-starred in Fox's short-lived 2009 sitcom Brothers and has done work for Spike TV and the DIY Network. Most important, he made an impression in 2010 as a fill-in for Philbin (who was recovering from heart surgery), and as one of 59 guest co-hosts this year as the show looked for Philbin's permanent replacement. Initial reports indicate that Strahan will continue to work on the NFL pregame show, produced on Sunday out of Los Angeles, despite rising early each weekday in New York for Live! That schedule won't be as strenuous as when Tom "the Fly Jock" Joyner flew between a morning job in Dallas and an afternoon job in Chicago every weekday for about eight years. But Strahan's workload would be taxing enough to test anyone, former pro athlete or not. Strahan sounded up for the challenge in May, when he spoke about possibly landing the gig. "I just look at it as an opportunity to go on TV and tell stories and have fun and entertain myself and other people," he told Showbiz Tonight. " … I think the show fits my personality." That personality has him on the verge of perhaps the biggest jump ever for a former NFL player. He's probably flashing his gap-toothed smile at the very thought.